APD Dumfries registered their second comprehensive win in the new Western Premier Division on Saturday to stay top after week two of the league. They beat Clydesdale, one of the pre-season favourites, by 98 runs at Benfield Park Nunholm thanks to a batting performance in bowler friendly conditions by opener Chris Bellwood that earned him the Manson Associates Man of the Match award. Dumfries were put in and after twenty overs needed to recover from 61 for 4 with the top order gone. Drew Dawson importantly shared a near fifty run partnership with Bellwood to bolster the innings as did Stuart Corbett-Byers to take the score past 150. 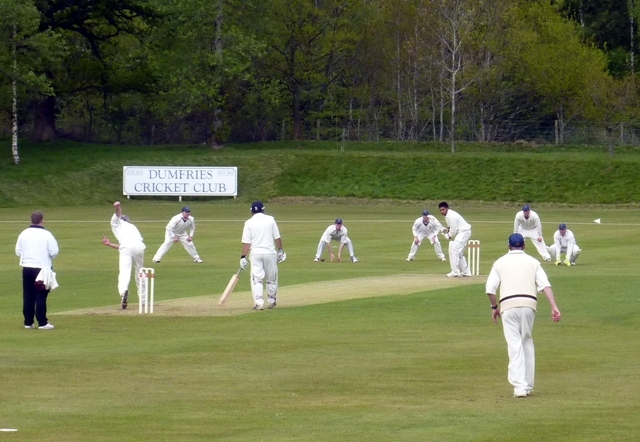 However it was Bellwood that gave the side a total of 168 for 7 to defend by dominating the Dumfries run scoring. He was unlucky to be stumped off the last ball for 99 after needing nine runs off the last over for a deserved century. With that target Clydesdale were in pole position but they were rapidly in trouble losing two wickets in the first two overs, one to Pat Druce in the first and one to Alan Davidson in the second. Druce then claimed two lbws, including Scotland all-rounder Haq, to leave Clydesdale four down for 17 after 5 overs. Awais played freely but was the fourth Druce victim caught for 21. Five down rapidly become more down as the left-arm spin of Scott Beveridge picked up the next four wickets and the last wicket fell with Clydesdale on just 70, two runs shy of a hundred run win for the league newcomers. In the league this Saturday Dumfries are away at Stirling. The Nunholm club’s junior coaching sessions run on Mondays from 6:15 to 8 at Dumfries Sports Club. These are open to non-members, boys and girls. For more details on junior, senior, and women’s cricket contact Trefor Williams (01387 256455), dumfriescricketclub@gmail.com, or see www.dumfriescricketclub.co.uk.